John Flood's Random Academic Thoughts (RATs): Your Worst Nightmare is Back....! Your Worst Nightmare is Back....! 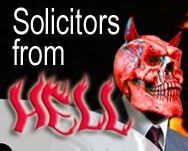 In June this year I asked "why does Solicitors from Hell" exist? That post received a comment today from pirate which said, "And back again solicitorsfromhell.net". Normal service has resumed under new owners. We believe that Kordowski’s legacy must be preserved and continued in this new format. By way of paying tribute to Kordowski we are reproducing the best segments from SolicitorsFromHell.co.uk, particularly past editorials. To those of you who want to use the official channels of complaint dealing with solicitors’ conduct being the Legal Ombudsman or the Solicitors Regulation Authority then as a first port of call we advise you to do so. This site caters for the disenfranchised legal consumer; in other words, those members of the public who are convinced the official route has not or will not serve their needs or the justice of their grievance. I think we're in for an interesting ride on this. I shall be very curious to see how the Law Society reacts. I have a feeling that Solicitors from Hell has mutated into the hydra and no matter how many sites the Law Society tries to close it will keep returning to haunt them. My Dog Used To Be Exactly Like This!